Olive tree (Olea Europaea) leaf D.E. (titrated to 40% in oleuropein), hawthorn (Crataegus oxyacantha) flower and leaf D.E. (titrated to 40% in flavonoids), gum arabic°, microcrystalline cellulose°, shepherd's purse (Capsella bursa-pastoris) herb D.E., fumitory (Fumaria officinalis) flowered herb D.E., silicon dioxide°°, plabt-based magnesium stearate°°. 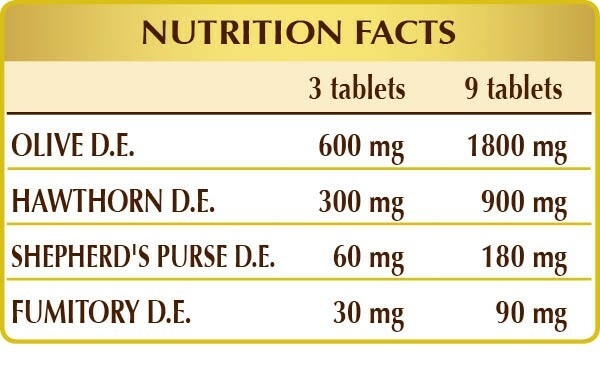 We recommend 3 tablets (1.2 g) one to three times a day at any time (3 to 9 tablets a day).